Designed to excel in challenging environments, the multi-frequency, multi-GNSS A326 uses Hemisphere’s Athena™ RTK engine and is Atlas® L-band capable. A326 is equipped with internal memory for data logging, download, and upload, and offers an on-board Wi-Fi hotspot. The addition of the easy-to-use webUI for quick and customized configurations makes it a versatile smart antenna, according to the company. The device receives signals from GPS, GLONASS, and BeiDou, and features 372 channels, as well as an update rate of 10 hertz standard, and 20 hertz optional with subscription. The durable enclosure houses both antenna and receiver, and it can be powered through various sources. Using multiple communication ports, such as Bluetooth, wi-fi, dual-Serial, and CAN options make A326 compatible with almost any interface, Hemisphere said. The A326 GNSS smart antenna supports Athena, the company’s new core GNSS engine. Athena is designed to offer significant improvements in the areas of initialization time, robustness in very difficult operating environments, performance over long baselines, and performance under scintillation. A326 is Atlas ready, capable of receiving corrections from Hemisphere’s Atlas global correction service and A326 is supported by Atlas Portal (www.AtlasGNSS.com), which allows users to update firmware and enable functionality, including Atlas subscriptions for accuracies from meter to sub-decimeter levels. 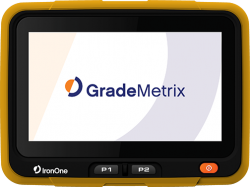 Also this week at CONEXPO-CON/AGG 2017, Hemisphere launched its IronOne Rugged Display & Computer for machine control applications.